I noticed recently that I have told my students to play with food in almost every class. I hope they have. After learning all the essential tips and techniques, the way to become a good cook is by experiencing the ingredients and having fun. On the weekends, I clean up the fridge and cook creatively. This weekend I had fresh cassava and sweet potato leftover from my class. While I was holding them in my hand, I heard an echo of Rösti. Rösti is a fried, grated potato dish made in Switzerland. I made a quick decision and at almost the same time my hand reached to turn on the oven to 450°F. I will heat up my well-seasoned 8-inch cast iron pan and make this quick & easy Thai dessert, Rösti style. Cooking with cassavas is not hard at all. After grating the cassava, Thai simply add enough sugar to sweeten to taste, and some salt to bridge the flavor; a bit of coconut milk can also be added to heighten the flavor. Then the mixture is steamed and grilled until it is cooked and translucent. But something new today that I haven’t tried before is adding grated sweet potato. Why not? It was perfect. I used about 2 parts cassava to 1 part sweet potato. The glutinous property of cassava helps the sweet potato hold up nicely, and the sweet potato gives a nice orange color and sweet compliment to the dish. 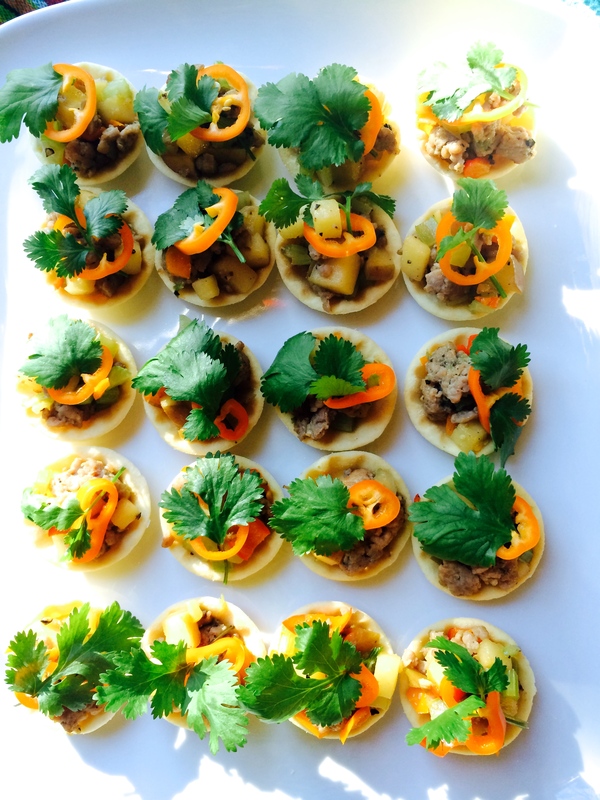 Learn something new while playing with food and discover a new excitement and a sweet reward to the lesson. Cassava-Sweet Potato Pancake makes a perfect snack or dessert with light herbal tea. Combine grated cassava, sweet potato, sugar, salt, coconut milk and rice flour in a large bowl; stir until well mixed. Heat 8-inch cast iron pan on medium heat and cover the entire surface with cooking oil. Pour cassava-sweet potato pancake mixture into the pan and spread out evenly. Place uncovered in the center of the oven and bake for 20 minutes, until the bottom is crusty brown. Then turn the oven to broil and place the pan right underneath. The top of the pancake should be 6 inches below the heat source. Remove when the top is brown, about 3 to 5 minutes. Keep an eye on it! A nice crusty brown is the most delicious part of the cake. Let the pancake rest for 5 to 10 minutes before serving. Serve warm or cold. 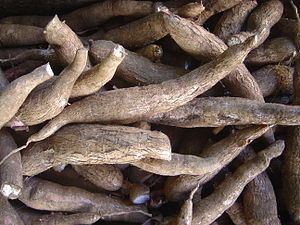 Cassava is a root from the Cassava or Tapioca Plant (Manihot esculenta Crantz). It is a bushy plant that grows to about 3 meters tall. It is an annual plant with underground food-storing root-tubers. The tuber is large and long with a dark brown skin and pink underneath to protect and keep the white flesh moist. In Thailand, cassava is usually boiled or roasted and serve with sugar. 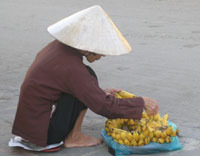 It also is made into various sweets combined with grated coconut and/or coconut milk and sugar. Raw cassava is poisonous, but when cooked it became a delicious dessert. Pearl tapioca and tapioca starch and flour are all products of cassava roots.